You know those projects that you have all the stuff for but never seem to get to? Well I may have bought a glass pendant kit and extras from Sun and Moon Craft Kits a while (ahem 2 years) ago. 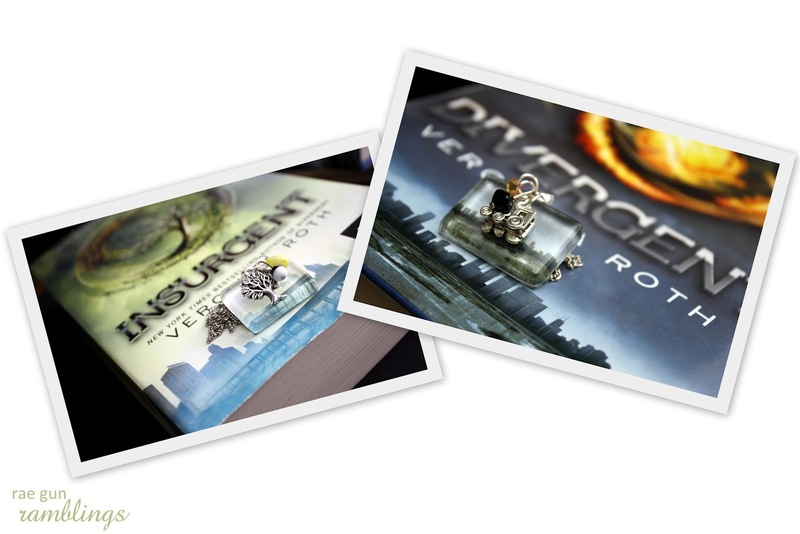 Wanting to do something in celebratory anticipation of Veronica Roth’s Insurgent release date (next week) I decided some solid fan jewelry (you know ’cause I don’t have enough) would be the perfect project. Including photo editing time but not drying time it was a real quickie. It only took me about an hour from start to finish. Nice right? 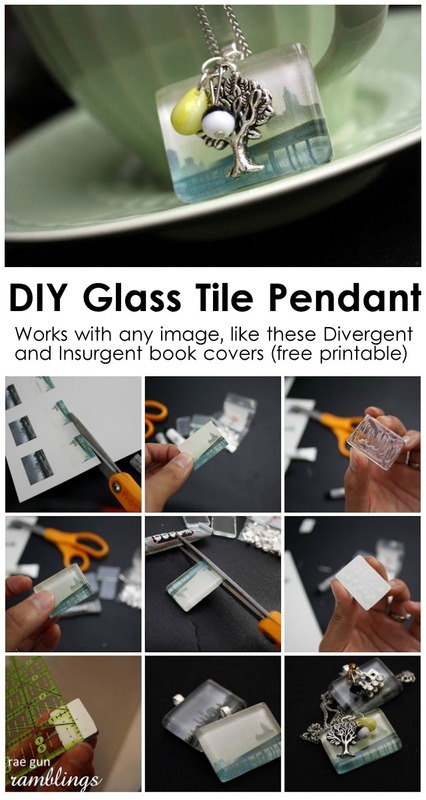 And if you want to make your own Divergent or Insurgent ones using my printables it will be loads faster. I LOVE how the Insurgent one turned out so much! The pendants are made with images from the book covers and then I added some charms and beads that are meaningful to each book. For the Insurgent one I did a tree for Amity and the cover. Also since we see a lot more of both Amity and Candor I used beads for their factions. The Divergent one is all Dauntless. I used a black bead since that’s their color, a train charm, and two orange yellow beads that reminded me of fire to symbolize the choosing of the faction by both Tris and Four. Fun right? Too nerdy? Impossible! Of course whether or not you’re the insane book nerd like me this is a fun easy (and cheap) project that can be used with any image, picture, or cool paper. It would make an awesome Mother’s Day gift if you used a cute picture or put mom’s initial or something she likes. Make or obtain your image (the ones I made are below if you want to use them). I just made the image 1 1/4 x 7/8 inches (the size of my tiles) in photoshop then I printed them on cardstock just with my inkjet printer. Cut images out. Lay tile on to since you may need to trim them more like I did. Apply a thin layer of glaze to the right (pretty) side of the image and then stick to the flat side of the tile. I did squiggles and then gently spread it with my finger. Press out any air bubbles. Allow to dry. (I only waited a few minutes). Trim excess paper if necessary. Apply glaze to the back side of the paper to seal. Allow dry (I let it dry for a few hours). Mark the position for you to attach the pendant bail, magnet or whatever you’re using the tile for. Attach the pendant bail (or whatever) with glue and allow to dry completely. If you want to add other fun charms and beads add do that. And your done so cute right? Oh yes, I LOVE!!! With my new love of beading anything to do with jewelry making has my attention. And I love these. What a great tutorial!!! Please share with my readers at SweetTalkin’ Sunday!! These are adorable!! Can’t wait to try this out!! These are so pretty and THANKS for the tutorial! I’ve seen things like this but not usually with directions for making them — pinned this to my Christmas Gift board. So very lovely! I haven’t tried this yet…but like you, I’ve had everything to do it…for too long! Thanks for the inspiration and the easy tutorial! Oh my…I just LOVE these! What a great idea. Thanks for teaching us how. These are great. What a great mothers day gift idea too. I would love if you shared them on my link party. The etched picture on that necklace is really beautiful. I also wanted to have something like this one. Oh my gosh!!! I love these!!! I’m going to have to try them! So so cute! I love these! thanks so much for sharing them at the naturally-nifty party! The tutorial and printables are great! Thanks so much! Great idea, Marissa! Yours turned out really nice! Very pretty! Thanks for the linky party too. Very cute! I really like the simple look of a picture behind glass tiles. Thanks for the tutorial! Thanks for linking up at Romance on a Dime!! I’m pinning this. Love it! This is really cute. I’ve made a couple pendants, but I like your much better. Nice job. Very nice tutorial to, thank you for sharing. Gorgeous, I love it! I’m sharing it on FB! 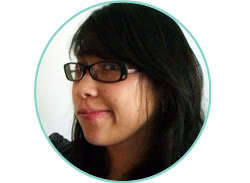 Thanks so much for sharing at Pin It and Win It Wednesday, hope you will come back next week too! What an awesome and super cute idea! You are so creative! I love super easy yet pretty craft ideas. Thank you for sharing these at my party Marissa! I’m totally out of the loop and haven’t heard of these books, but the pendants are beautiful! Now I’m going to have to check out the bookstore & the craft store this weekend! Thanks for linking up. Those are awesome! Divergent is on my list of books to read next! Thanks for linking up to the Pomp Party! Pinning to our Pomp Party board! I love it! What a great gift idea! Thanks for linking it up! Lovely tutorial and the necklaces are so charming! Marissa! I love these! Making my own jewelry is something on my to-do list for this summer! Can’t wait to see what you link up this week! I LOVE the way your necklaces turned out! I really need to give them a try, thanks for the tutorial. Thanks for sharing with us at Link It Up Thursday. Very nice. Thank you for sharing at Sharing Saturday! I hope you are having a wonderful week! these are so pretty, Marissa! Thanks for sharing. have a fab weekend! I was wondering where you bought all of your supplies that you used for your craft?? Thank you! Yvonne, if you look in my list of materials I have the an etsy shop linked that sells kits for the tiles and glue and stuff. I got the charms and beads from a local craft store. You can probably go to a craft or bead store or look on Etsy and find really similar pieces. I LOVE this, I seem to be wanting to craft lately so this is an easy way to start :) Laura stopping by from Real Momma and the Best of Your Best Blog Hop! This is so great, I love the tree charm thanks so much for linking up at the the Best of Your Best Blog hop at Miss Information!